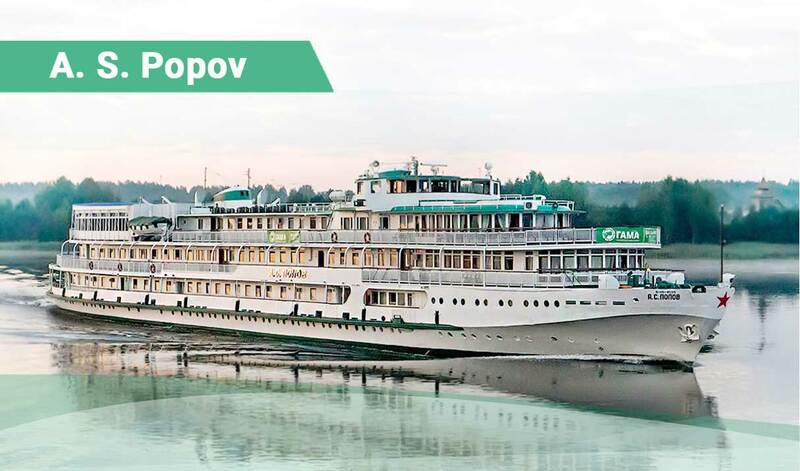 The river cruises will fill your holiday with marvellous river landscapes, clean fresh air, glitter of river waves and reveal you the history, culture and places of interest of towns and cities and republics of Russia. Moscow, Saint-Petersburg, Astrakhan, Yaroslavl, Nizhny Novgorod, Kazan are only some of the cities the ship routes include. During the journey you will have a chance to see the Great Russian Rivers, age-old monasteries and churches and get to know traditions and customs of Russians peoples. The ships of the company “GAMA” offer all the conveniences of comfortable hotel rooms. There are cosy restaurants on the ships, where you will be offered delicious breakfast, lunch and dinner. At lunch and dinner there is a menu for order (a meal of 2-3 courses to choose from). You will be served by friendly waiters. If you would like to order at bars and restaurants banquet dishes, alcohol and soft beverages from the menu to suit any taste, we are ready to satisfy your needs whereas this service will be charged additionally. Besides you will be offered an exciting inspiring entertaining program on board: discotheques, contests, concerts (live music, vocal performance), singing with accordion or piano. Apart from that you can take part in interesting events devoted to the history, culture and usual life of Russia. You can enjoy traditional Russian tea with samovar, folk craft master classes. River cruises within Russia will be a true adventure with plenty of great impressions and new knowledge for you to get during the holiday. To book tickets and get any information needed feel free to use the feedback form or call our employees with contact numbers given. One of the most popular directions of the river holiday is the cruise Moscow-Astrakhan-Moscow for 18 days. During the journey you can see practically all main cities and towns of Russia from its heart Moscow up to the southern town – Astrakhan. On the way of to Kazan you will have an opportunity to fancy picturesque banks of the upper Volga, visit the Russia-specific lands and admire the famous old time towns, such as Uglich, Myshkin, Rybinsk, Yaroslavl, Kostroma, Plyos, Nizhny Novgorod city. From Kazan to Atrakhan there are fewer residential places. Here you can go sightseeing in Samara, Saratov, Volgograd and taste the famous Astrakhan watermelons, tomatoes, balyk (cured fillet), warm yourselves and sunbathe. We mustn't forget, no doubt, that this is one of the best places for fishing, of course. On board the ships there are: 2 restaurants, 2 bars, a reading saloon, an open solarium, a first aid room, a cinema, an entertaining program, a discotheque and route information. At your disposal there are: 2-bed cabins without WC/shower, 3- and 4-bed cabins with a wash basin (hot/cold running water), 1, 2-, 3-bed cabins with WC (shower, WC, fridge, air conditioning), premium cabins "Junior Suite" (shower, WC, fridge, air conditioning) and "Suite" (all modern convenienсеs, TV with video, air conditioning, open-up sofa). We offer you to join our comfortable double deck ships river cruises. During the journey you can combine your rest with a tough interesting excursion program. 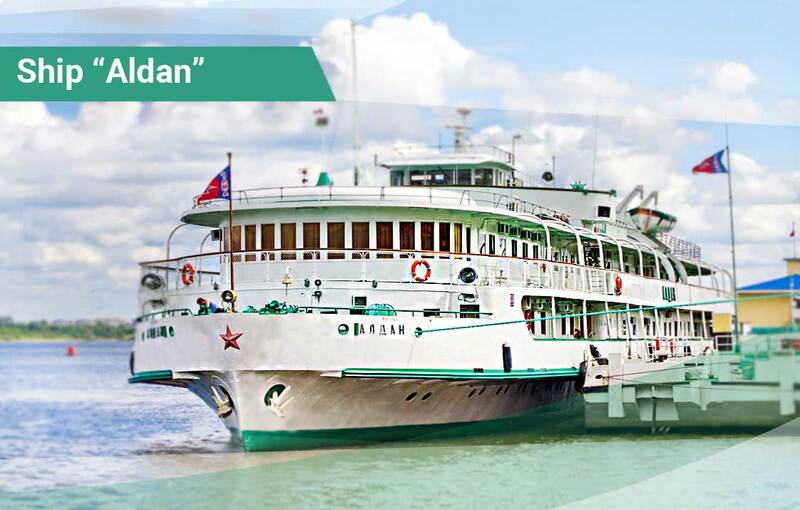 «Аldan» is a comfortable double deck ship which goes on a cruise to the rivers such as theVolga, the Oka, the White river on a regular basis and visits such towns and cities as Gorodets, Cheboksary, Kazan, Ufa, Bolgary, Elabuga, Yaroslavl, Myshkin, Murom and Makaryevo as well. Features of the ship «Аldan»: length - 78 m, width - 15,2 m, draft - 1,45 m, rate of sailing - 18 km/h. Having rather a small draft (1,4 m) lets the ship cruise even on shallow-water rivers. On board the ships there are: 2 restaurants, a bar / musical saloon, a children room, an ironing room, a first aid room and an open solarium. At your disposal there are: 2-, 3- and 4-bed cabins with conveniences (shower, WC, fridge, air conditioning (on the lower deck there is no air conditioning), premium cabins "Junior Suite" and "Suite" (all modern convenienсеs, TV with video, air conditioning and a fridge). 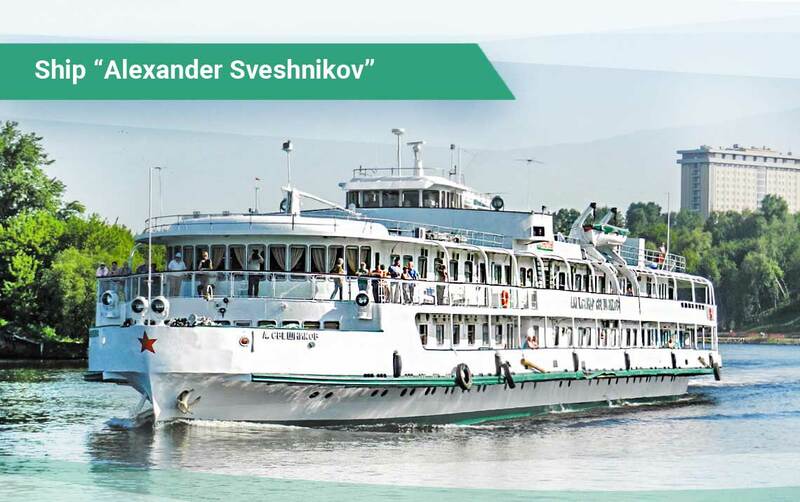 Ship “Alexander Sveshnikov” is a comfortable double deck ship which goes on a cruise to the rivers such as the Volga, the Oka, the White river on a regular basis and visits such towns and cities as Cheboksary, Kazan, Ufa, Bolgary, Elabuga, Perm, Yaroslavl, Moscow, Tver and Ryazan. Features of the ships: length - 78 m, width - 15,2 m, draft - 1,45 m, rate of sailing - 18 km/h. Having rather a small draft (1,4 m) lets the ship cruise even on shallow-water rivers. At your disposal there are: 2-, 3- and 4-bed cabins with conveniences (shower, WC, fridge, air conditioning), premium cabins "Junior Suite" and "Suite" (all modern convenienсеs, TV with video, air conditioning and a fridge). The route Moscow-St.Petersburg is considered to be a landmark of Russia. During the cruise you will have a holiday on board a comfortable ship and get to know a lot about the Russian history and traditions. The cruise from Moscow to St.Petersburg includes stops at the following places: Uglish, Goritsy, Mandrogi, Sosnovets (transfer on the White Sea towards the Solovetskiye islands), the islands Valaam, Kizhi, and of course a stop in the Northern capital – the terrific city of St.Petersburg. In each place you will be offered informative walking tours or bus excursions. Palaces, beautiful parks, drawbridges of St.Petersburg, Goritsky monastery, the Moscow Kremlin, the architecture ensemble on the Solovetskiye islands, the Kizhi islands, Valaam! It must be underlined that these are only a small part of fascinating places you are going to visit. The cruise line is served with the 3-deck ship “A.S. Popov”. On board the ships there are: 2 restaurants, a bar, a first aid room, and comfortable cabins. Length - 95,8 m, width - 14,3 m, draft - 2,45 m, rate of sailing - 21 km/h. 1. Call us: 8-800-5555-245 (free of charge for all regions of Russia). Our manager will help you choose a river cruise and book a cabin. 2. Per e-mail gama-prim@sinn.ru you will get an invoice for payment which you will pay at any preferable bank. Step 1. You need to register at our site in your online account, put in your e-mail (login) and your password. Then you are to fill in the contact personal information (all gaps are to be filled in). Step 2. Go to “Search a cruise” («Поиск круиза»), put in your dates of departure and arrival, the names of cities of departures and arrival, route and ship (in case you know the name). Press “Find a cruise” («Найти круиз»). The system will offer you variants of cruises to choose from. Step 3. After you have found a suitable route and a ship you pass over to booking a cabin (cabins available online). Click on the cabin number from the list you can see its detailed description and the price. Fill in the gaps “Client” («Покупатель») and “The list of tourists” («Список туристов»), input your passport data. All gaps are to be filled in. We draw your attention to the fact that you cannot book a cabin partly. If you need a cabin with cabin mates or other variants of accommodation, we kindly ask you to give us this information in the gap “Requests, notifications” («Пожелания, замечания»). Here you can leave all the necessary information, for instance, if you would like the price to cover excursions, the accommodation type etc. In the gap “Order Feedback” («Обратная связь по заявке») you can correspond with our manager concerning all the issues which matter to you. After that, please, press the button “Book” «Забронировать». The procedure is totally free of charge. In your online account you can see all your created orders. The confirmation by the manager of the company ООО «GАМА» takes place within a day (24 hours) on week days. While booking a tour on Saturday or Sunday the confirmation will be sent to you on Monday. The final price of the tour can be seen when you log in your online account and get to the gap “Confirmed cruises” («Подтвержденные круизы»). 2. Besides you can pay the journey via bank card online. After paying the order in the box “Feedback” («Обратная связь по заявке») you can receive the tour documents (agreement, voucher, safety instructions). To get on board the ship make sure you have all the documents mentioned as well as your passport with you.